Laura Spinney encounters a Paris exhibition that probes algorithmic creativity. Artists and Robots Grand Palais, Paris, until 9 July 2018. Visiting the exhibition Artists and Robots at the Grand Palais in Paris, I happened on the artist ORLAN, best known for her work involving body modification. She was standing close to her 2017 work ORLAN and the ORLANOID, in which her video presence interrogates a lookalike robot on matters of life and death. Having borrowed the robot’s lensless glasses for a photo shoot, she needed her own back. I was struck by the robot’s lack of reaction as she made the swap. It underscored my answer to the question posed by this exhibition: can a robot create a work of visual art? My feeling is no, for the simple reason that it can’t see. I recommend a visit to the show, nonetheless. It forced me to examine what I mean by seeing or — more broadly — sensing the world, and hence what I mean by art. CYSPP1, a 1956 cybernetic sculpture with autonomous movement, by Nicholas Schöffer.Credit: Artwork courtesy of Frank James Marlot–Eleonore Schöffer Collection. Photo by Aldo Paredes for Rmn-Grand Palais 2018. Adagp Paris 2018. The exhibition showcases robots and their output in three roughly chronological sections. 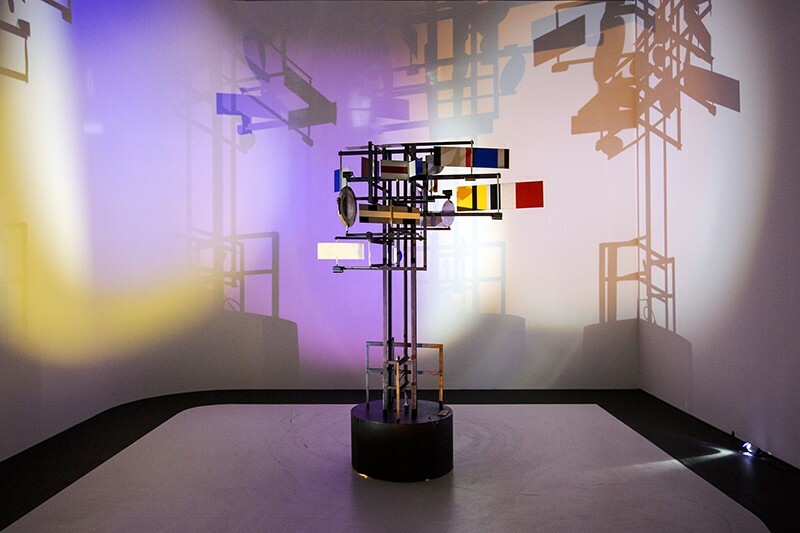 The first recounts how, starting in the 1950s, visionary artists such as Jean Tinguely and Nicolas Schöffer built robots — to begin with, no more than collections of mobile parts driven by motors — to create kinetic art. The second tracks that impulse forward from the digital revolution, starting in the 1970s. And the third, optimistically entitled ‘The robot emancipates itself’, explores their present status and looks to the future. When robots were all jointed arms and motors, they executed an artist’s vision channelled by their own capacities as machines. Modern French artist Patrick Tresset’s ironic spin on this relationship features in the first section of the show. 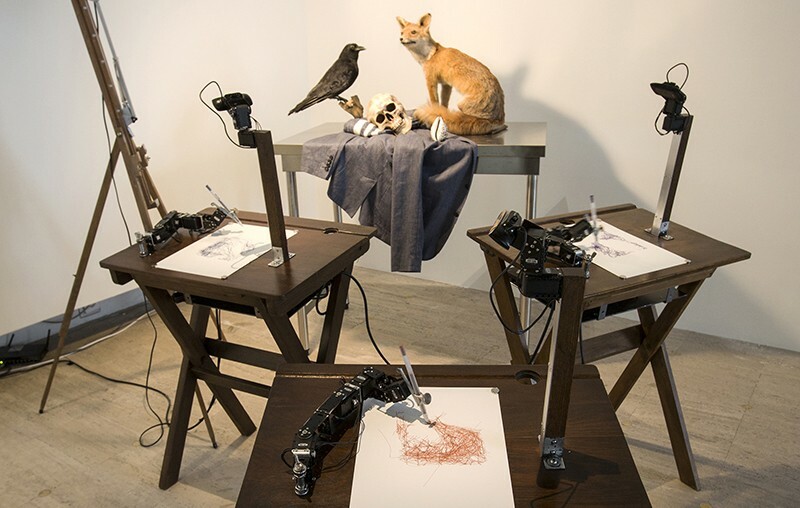 In the installation Human Study #2, three sets of robot arms and cameras — the ‘hand’ and ‘eye’ — repeatedly draw a set of objects including a stuffed fox and a human skull. They are programmed to copy both the objects and Tresset’s drawing technique, while introducing small variations that he characterizes as artistic, expressive and obsessional. It’s through such serendipitous additions and mistakes, the artist seems to suggest, that the greats became great. The digital revolution ushered in software and algorithms as artists’ tools or assistants, and the technical possibilities exploded. We see this in stunning works in this second section, from conceptual artist Joan Fontcuberta’s self-described “hallucinatory” landscapes to labyrinthine wallpaper from multimedia whizz Peter Kogler. 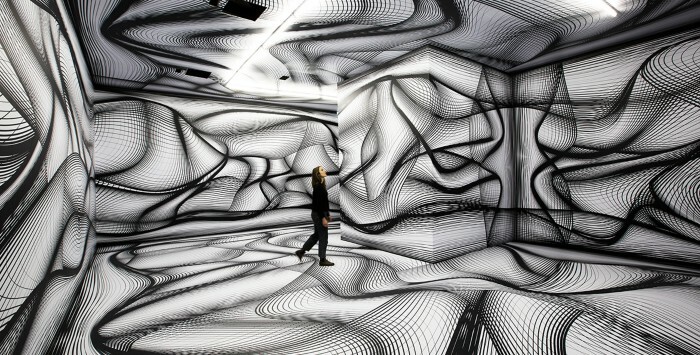 This covers an entire room, so that we seem to be enclosed in an optical illusion. For me, the works’ technical sophistication seems only to accentuate their soullessness, and never more so than when they show up the fallibility of human perception. In 2003–04 paintings from his Orogenesis series, for example, Fontcuberta takes algorithms that create 3D landscapes from 2D map coordinates, and forces them to re-interpret the landscape paintings of artists such as J. M. W. Turner and Paul Cézanne. 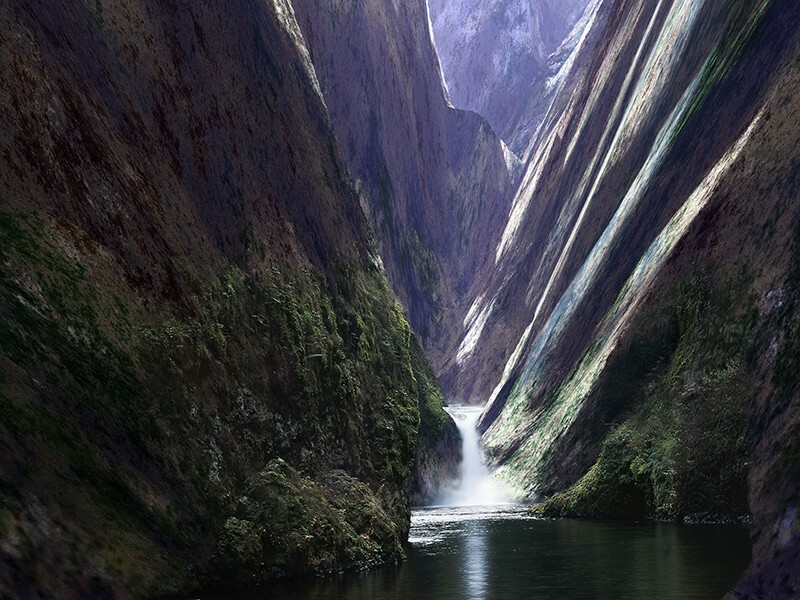 The results are highly naturalistic, but they reminded me of Swiss writer Charles-Ferdinand Ramuz’s idea that once the human element is banished from a place, it becomes a non-place. Likewise Michael Hansmeyer’s 2017 Astana Columns. 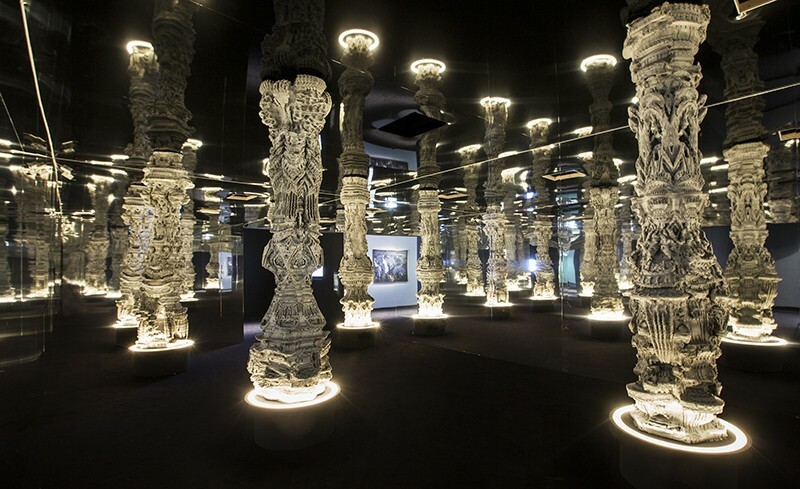 These architectural forms, created by an algorithm that applies evolutionary principles to repeatedly subdivide a Doric column, were assembled from laser-cut cardboard and other materials. They provoke awe through their sheer complexity, but in the way that a termite mound does: what’s impressive is not that they were imagined, but that they were unimagined. By the time I reached the future-facing section, where I bumped into ORLAN, I had concluded that notwithstanding the section’s title, the robot had not emancipated itself. Pascal Haudressy’s 2009 animation Brain, for example, evolves thanks to glitches the artist introduced into the governing algorithm; these force the computer to continuously recalculate the coordinates of each pixel. Ultimately, however, it is less impressive than animations of the actual evolution of the human brain. Although artificial intelligence has advanced by leaps and bounds since the 1950s, artificial imagination is still in the starting blocks. As curators Laurence Bertrand Dorléac and Jérôme Neutres suggest in an explanatory video, these are artists’ robots rather than robot artists. But if the show doesn’t tell you what art is, it does venture into fascinating new territory to tell you what it’s not: random copying errors might be necessary, but they are also insufficient. That said, perhaps robot imaginations have already liberated themselves outside the confines of human artists’ studios, and their art is radically different from ours; so different that we don’t recognize it when we see it, glasses or no glasses. I can’t wait for the first exhibition curated by robots — assuming it’s advertised to non-robots.